Dominant discourses and approaches tend to emphasize the dichotomy between instrumental (anthropocentric) vs. intrinsic (non-anthropocentric) dimensions of nature. Instead, a relational value perspective tends to emphasize the value of the interactions between people and nature and those among individuals in society. 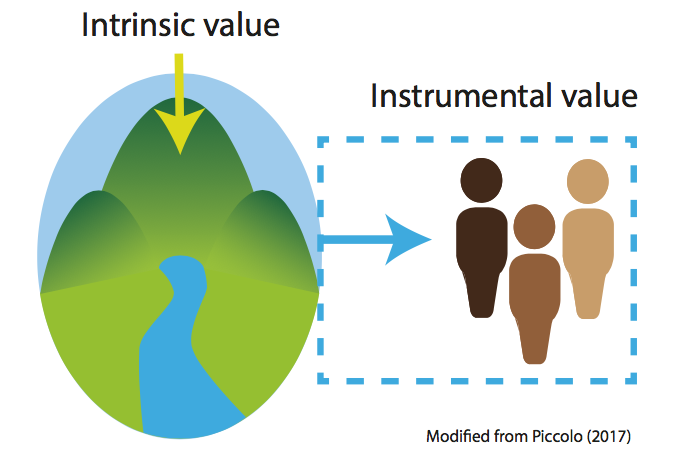 Hence, much of the policy discourse on the need for valuation of nature’s contributions to people heavily relies on either a one-dimensional value lens (value-monism) that derives from a utilitarian economic perspective or on an environmental ethics stance of nature-human relationships, furthering the instrumental vs. intrinsic dichotomy. Thus, a plural value lens (value-pluralism) can encompass a wide variety of dimensions that assess the interdependence between nature and societies, including biophysical, health, sociocultural or holistic approaches. Depending on whether a one-dimensional or more diverse (value pluralism) lens is applied policy objectives, as well as policy instruments will be determined differently through formal and informal institutions, which themselves co-evolve with such value systems. Taking on a more integrated valuation approach that represents a multitude of different worldviews instead of a single one might also change policy design. As in the above illustration alternative worldviews, foci of value, policy objectives, valuation approaches, value indicators, as well as policy support tools and instruments can be incorporated in very different ways. While in reality different worldviews may coexist, for simplification, the model shown in the figure treats them as separate. The figure shows that there are monistic worldviews for understanding the value of biodiversity and ecosystem services that emphasize ecological/biophysical, social, cultural or economic approaches to valuation (panel on the left hand side). 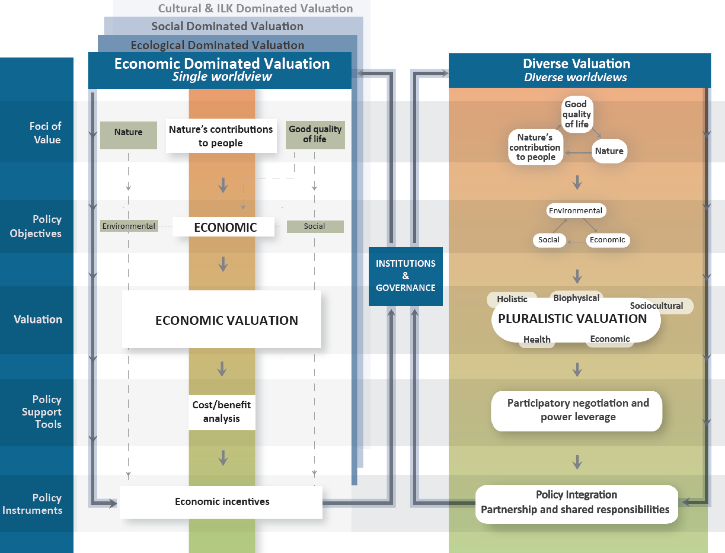 By contrast, an approach to valuation that recognizes a wide range of worldviews (panel on the right hand side), and that is more inclusive by acknowledging the existence of a diversity of values and valuation approaches, would allow for developing the conditions for the design of more comprehensive and deliberative policy support tools and policy instruments to enhance nature, nature’s contributions to people and good quality of life. This alternative approach highlights that valuation process needs to account for multiple worldviews in a more integrated and iterative way, both within and among the different valuation steps. This is based on the premise that human (social and economic) activities ultimately depend on ecosystems and that there are strong feedback mechanisms linking nature, nature’s contributions to people and a good quality of life. 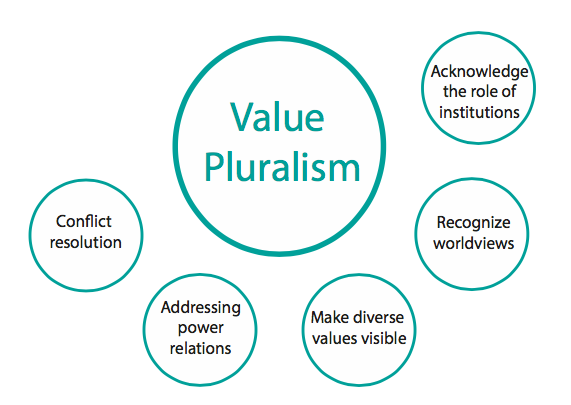 A value ethics that embraces value pluralism by acknowledging the diversity of worldviews may lead to a different approach regarding the identification of policy objectives and instruments. Such an approach would take a social-ecological perspective, where nature and it’s contributions to people for a good quality of life are seen as interdependent. Additionally this approach would require applying deliberative approaches towards potential conflict resolution over values. This is associated with the need to leverage power relations through participatory negotiations among stakeholders holding incommensurable values over human-nature relations. Recognizing, making visible, and respecting the diverse values at stake and addressing power relations through which these are expressed, are all needed in order to effectively and equitably bridge different value systems, eventually allowing processes of social learning. 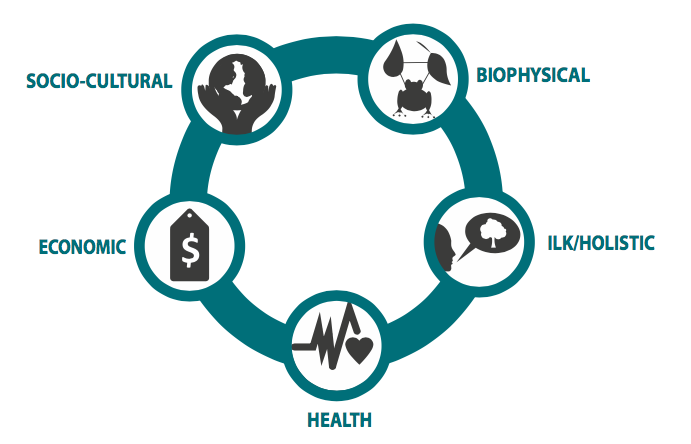 This integrative approach opens the opportunity to bridge biophysical, socio-cultural, economic, health, or holistic perspectives on valuation. This approach also calls for acknowledging the existence of different perceptions of what constitutes a ‘good life’ across social groups and cultures. Last, but not least, it highlights the need to acknowledge the role of institutions, including social norms that underpin human-nature relations. Policy can not only support changes in social norms but also favour deliberative policy tools, which recognize the diversity of values as well as resolution approaches when value conflicts arise. The word “value” has interrelated but distinct dimensions and is understood and analysed differently in the biophysical sciences, social sciences, economics, and from indigenous and local knowledge perspectives. Moreover, the word ‘value’ has different meanings. Values as principles, preferences and subjective importance are assigned to things on the basis of people’s experiences, beliefs and understandings. People attribute values to nature, nature’s contributions to people and constituents of a good quality of life and we assign measures to quantify them. • Values associated to nature and its contributions to people can be non-anthropocentric such as intrinsic values, which are independent of any human experience and evaluation. They refer to the inherent value of nature and its components which is not ascribed or generated by external agents (such as human beings). • They can also be anthropocentric such as instrumental values, which often relate to nature’s contributions to people and refer to the value attributed to something as a means to achieve a particular end. • They can also be relational values, which reflect symbolic relationships with natural entities to the extent that such relationships are embedded in people’s identity and every day. They reveal elements of cultural identity, social cohesion, social responsibility and moral responsibility towards nature. This type of relationship with nature is also part of the set of nature’s contributions to people that impinge on people’s good quality of life, such as those associated with learning and artistic inspiration, symbolic meanings, and cultural identity connections. This kaleidoscopic view on values – intrinsic, instrumental and relational – permeates the ways we understand our relationship with nature. This makes it necessary to expand the way society recognizes the diversity of values and embraces pluralistic valuation approaches. With regard to the enormous range of existing values, the IPBES approach to unravelling such diversity of values, presented here can not be exhaustive and is not prescriptive. Multiple values may be formed and elicited within different cultural, social and institutional frameworks. Values are assigned to things in alignment with people’s experiences, beliefs and understandings, which are in turn influenced by their socio-cultural context. 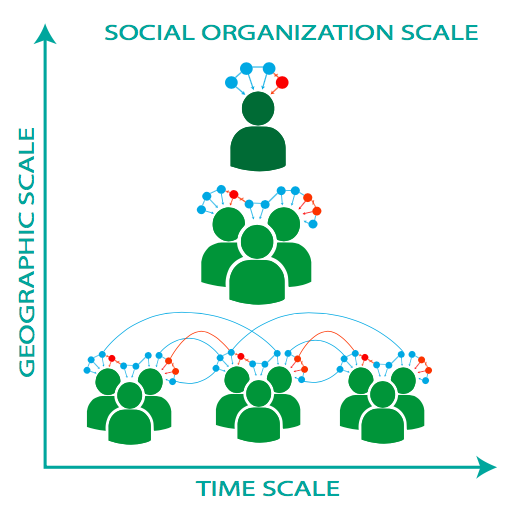 These values shared by people in groups or that inform shared identity of a particular group, cannot be elicited by valuation tools that focus on values only as a measure. Underlying worldviews determine which types of value and valuation approaches and methods may be perceived as appropriate in any given context. In the same sense, people normally seek to act in ways that are consistent with their values. However, there can be paradoxes and trade-offs in the set of values of the same individual and even more among different stakeholders. Thus, understanding what values are and how they are conceptualized and formed, and how they change across contexts, scales and time is critical to inform decision making and policy design at local, national and global levels. Acknowledging, assessing and explicitly including the diversity of values while identifying their specific uptake into policy design is challenging, as it requires an equally integrative vision and toolbox. 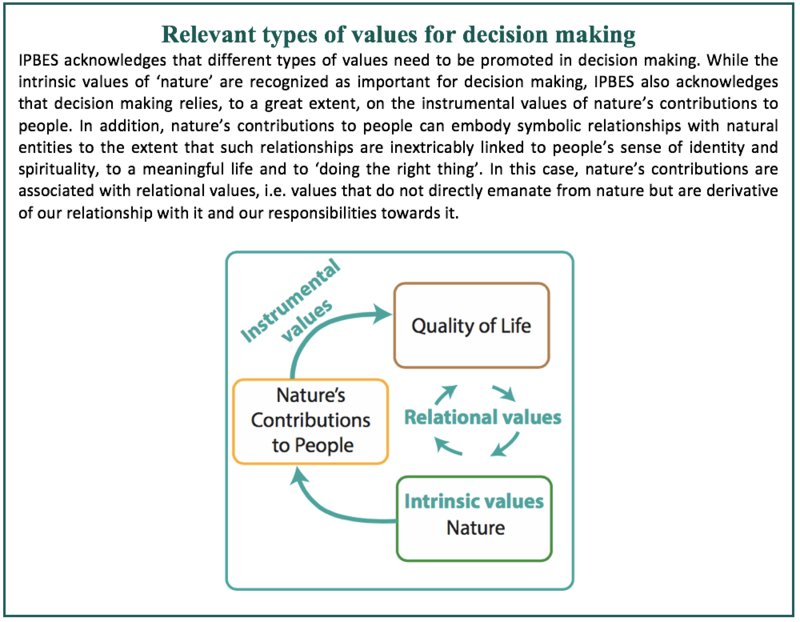 Decision making processes would benefit from pluralistic ways of valuation, and this means finding and supporting means to include values held by the full range of stakeholders with different worldviews of nature, nature’s contributions to people and a good quality of life, at different spatial and temporal scales. Heterogeneous valuation methods and their integration across domains should be considered to represent the plurality of worldviews leading to a diversity of values. Depending on the purpose of valuation a multi-method approach may be necessary. Most valuation methods are inherently multidimensional, and draw from multiple data sources to provide comprehensive assessments of values and contextual explanations for how and why values develop and change. 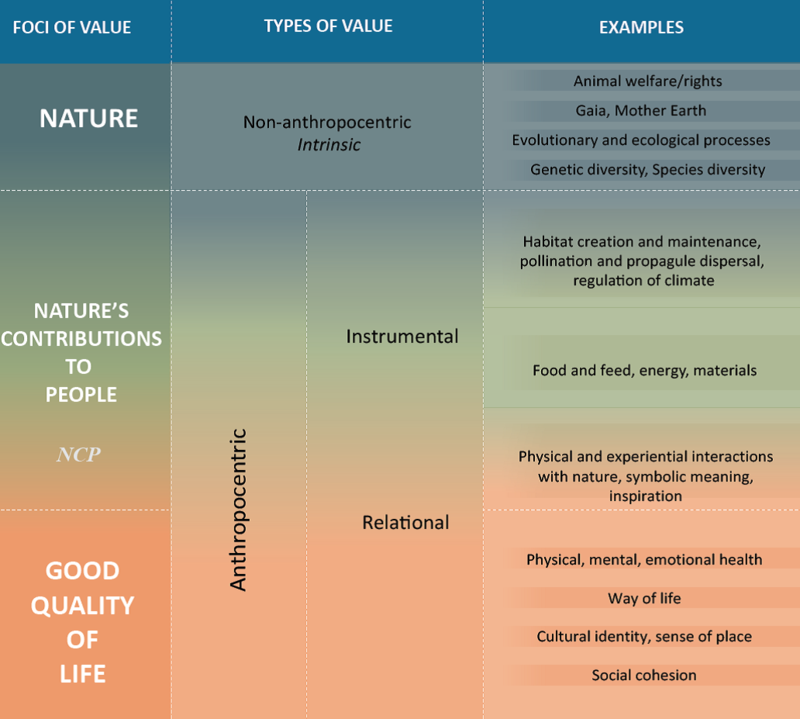 Some approaches will emphasize the quantification of biophysical and ecological attributes of nature, others can focus on the physical, cultural and socio-psychological benefits from nature, while others can address the moral values that influence what is meant by ‘good quality of life’. The approach to valuation depends on the particular way of thinking and the perspectives concerning the way people see and manage their relation and interaction with nature. Valuation methods do not simply identify pre-existing values; they also act as value articulating institutions in themselves. For instance, they influence the way in which particular environmental resources are described (e.g. a commodity or a common pool resource) or the relative importance awarded to different types of value (e.g. instrumental over relational values). When identifying the diversity of values it will sometimes be the case that value trade-offs and incommensurability among values will be encountered and thus need to be acknowledged. This will require that the power relations among those holding conflicting and incommensurable values be assessed. Acknowledging, assessing, and explicitly including the diversity of values while identifying their specific uptake into policy design is challenging because it requires a more integrated vision and toolbox than the fragmented one we currently have or have access to in different parts of the world. Decision-making process would benefit if they addressed the values of biodiversity and ecosystem services through plural approaches – which, in turn, means to have the appropriate methods and tools for valuation. Valuation methods choices are not just technical, they are also political, because they are subject to the preferences of people holding the power to influence choice and thus influence the scope and orientation of results. The type of approach taken and the type of questions asked, as well as the methods selected to elicit what is presumably technical knowledge, all influence and often implicitly decide on whose values are included and which values are featured. How to frame what methods are used, what questions are asked, what data is collected, or what interpretation is given to the results, can involve a political dimension. Making the reasons for such choices explicit and context specific can help highlight value dimensions more clearly in decision making.